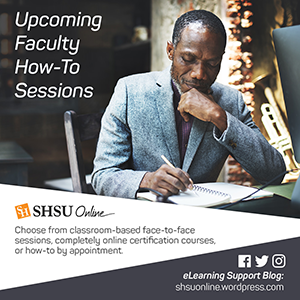 SHSU Online is thankful that we can offer a number of faculty development opportunities via different avenues for November and December of 2016. Cut down on student stress by layering academic and mechanical instructions throughout your course. With students, everything revolves around context. They are becoming used to getting contextual information about the restaurant where they are eating, the traffic they are driving in, and the television shows they are watching. That is why it is important to not just put instructions in your course syllabus. They need to placed at the unit and assignment level as well. A big key here is not just revealing the academic instructions that tell the students the requirements of a particular assignment or activity, but the mechanical instructions that tell the students how to use the particular tool to complete the assignment or activity. Relying on the fact that your students may be “digital natives” is just not a good strategy when it comes to them figuring out how to maneuver in your Blackboard Course. If your students are completing an activity using one of the learning management system’s tools, why not give them a reminder on where to click to begin and then provide a link to help documentation (from help.blackboard.com) on how to use the tool they are being assigned. Making these best practices a regular part of your course design and development will go a long way toward ensuring that your students are able to work through course activities with more success and less stress. Increase the value of video in your Blackboard course with Kaltura’s interactive video quizzes. Make the content and the learning experience more engaging. Make education more flexible and personalized. Help the students and faculty be more collaborative. We also know that connecting this multimedia content to an activity can help the students cement what they are learning by applying it in an assessment or thinking critically about it with a reflection. or shorten your video content so much that the overall message gets disjointed. If either of these drawbacks has frustrated you in the past, then do we have some news for you! Kaltura now as the ability to add interactive video quizzes to your videos. Kaltura Interactive Video Quizzing seamlessly embeds multiple choice questions at any point in a video. With this tool, you can easily add your own questions through a user-friendly interface. The questions are attached to the video and “travel” with it wherever it is embedded. As students watch the video, the questions will appear at the chosen points; the video continues after each question is answered. Are you interested in learning more about Video Quizzing in Kaltura? Why not sign up for our completely online Multimedia in Blackboard Courses course which covers Kaltura, YouTube, NBC Learn, inserting images in your course and more!